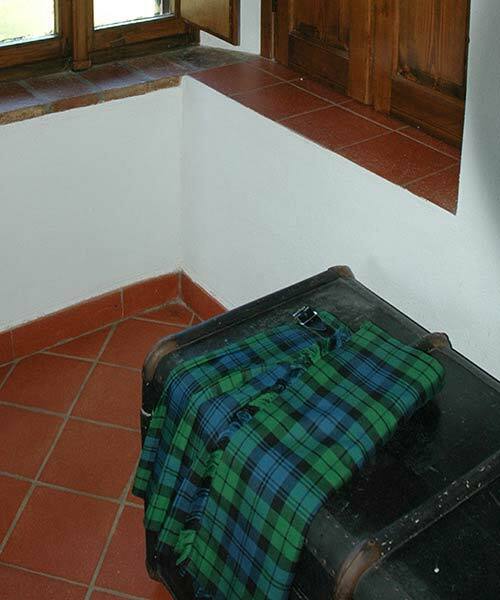 The traditional kilt. What's so special about a kilt? The kilt had its origin in the Scottish Highlands. Originally a kilt was a rather primitive garment used for daily wear in the Highlands and it had little resemblance with the kilt we know today. A kilt might as best be defined as a knee-length hanging or skirted garment with deep pleats at the rear. Not until the 19th century Scottish lowlanders, counting for about 80% of the Scottish population, would wear a kilt at all. Thus, the fact that the kilt has become worldwide known is primarily due to a small minority and their descendants. Is a kilt a skirt? 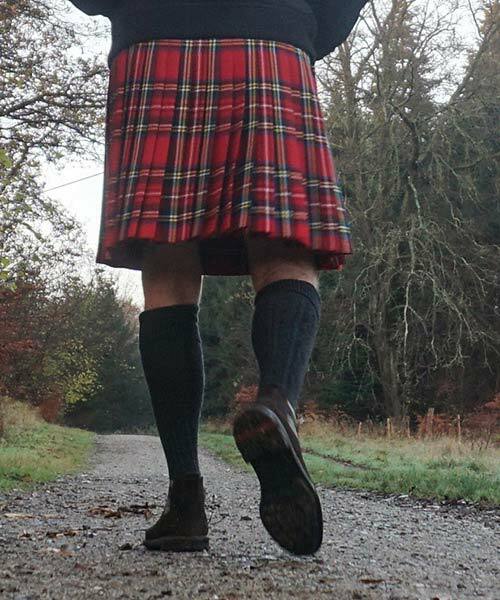 According to The European Union Statistics Bureau, Eurostat, the kilt is (no longer) a skirt but a men’s special garment. What happens after Brexit no one knows. Well, honestly the kilt is a skirt, and in all dictionaries I have seen it is described as a skirt or kind of skirt. But so what? A Mercedes-Benz is a car, but far from every car is a Mercedes-Benz. Yes, they do. But their kilts are lighter; they use fewer yardages and have thinner straps and buckles than a (man’s) kilt and they may be longer or shorter. Women’s kilts are – at least in Scotland and kilted environments - called kilted skirts, but elsewhere more and more people just call them kilts, it seems. Young lady looking good in her short kilt/mini-kilt/kilted skirt. By all means the difference between a man’s and a woman’s kilt is considerably bigger than between his and her jeans. His and her kilts. Same waist. The difference is obvious. 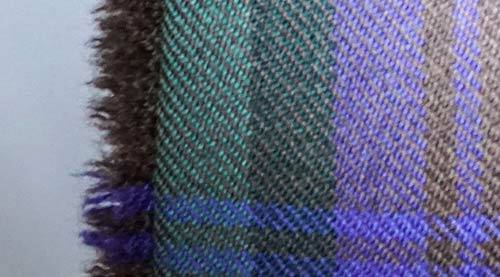 His kilt, Ramsay blue tartan, hers Stewart Royal muted. 5 yard made-to-measure kilt, 16 oz. wool, Stewart Royal tartan. 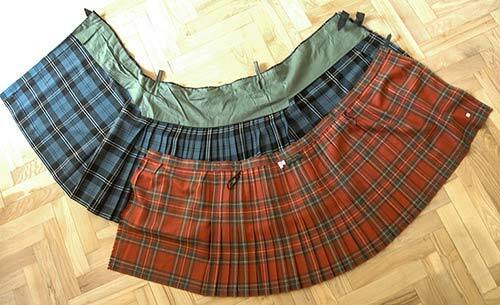 If you open up the kilt and place it flat on the floor you’ll see a lot of fabric and that it consists of three parts. To the right you have the under apron, to the left the over apron, and in the middle the pleated section which is to be at your rear. Where each of the aprons is approximately half your waist size, the rest, the pleated section, will vary with the yardage of your kilt. 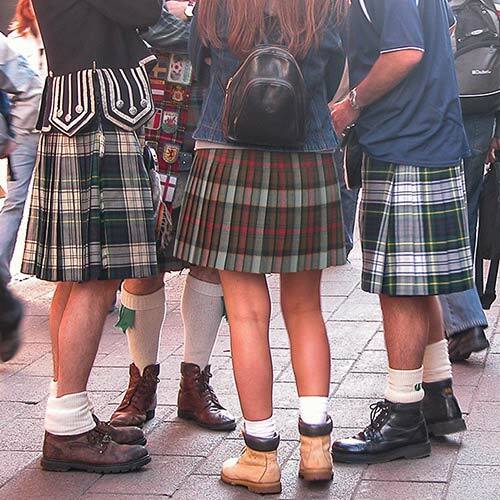 You can have 4, 5, 6, 7, and 8 yard kilts. One vendor even has a 2 yard kilt to offer. 8 yards used to be the norm, and very cheap imported PV-kilts, as well as most expensive wool kilts, are still 8 yarders. But most fine wool kilts today might be 5 yard kilts, making a good compromise between cost and authenticity. The kilt seen from inside. A kilt is held together by a strap and a buckle above each of your hips. At your right hip you sometimes have an extra buckle and a strap. But three are not better than two and two not better than three. The strap which fastens the under apron to the buckle on your left. 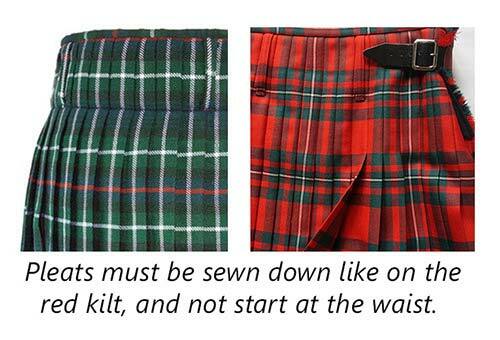 On a real kilt the pleats don’t fold out from the waist but are sewn down 15-20 cm. This part is called the fell. A kilt without a fell is no kilt and should be avoided. 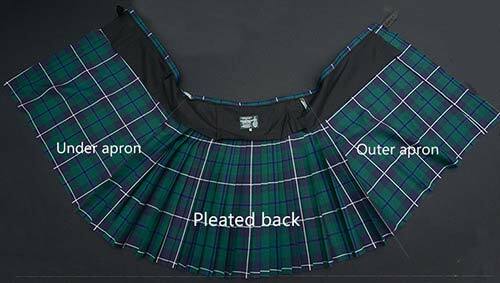 Regarding the pleats, standard is knife pleated to the sett, meaning all the pleats go in the same direction, and that they are arranged in a way that the tartan looks approximately the same whether you are looking at the kilt from behind or from the front. The pleating is where things are difficult, because the more precise the better your kilt shall look – and the more expensive it shall be. Instead of having your kilt pleated to the sett, you may have it knife pleated to the stripe, also called military pleating. When pleated to the stripe, each of the pleats is arranged according to a chosen colour, rather than to the entire sett. Therefore the kilt shall look quite different when looked at from behind and from the front. Hardly to order on the internet. A third option is box pleated, meaning that the kilt shall have rather broad, flat panels on the back. Only by few kilt vendors you can order a box pleated kilt. The fabric is often referred to as the tartan, meaning both cloth and pattern. A woollen cloth woven in one of several patterns of coloured checks and intersecting lines, especially of a design associated with a particular Scottish clan. The tartan is defined by its weight in ounces (1 oz. = 28.35 g) for one yard of double width cloth (about 60 inch = 140 cm). An 8 yard kilt can in most cases be made of 4 yard double width or 8 yard single width tartan (about 30 inch wide). Heavy weight = 16 oz.+ might not be the optimal choice on a hot summer day. To most purists 16 oz. (or more) is a must, however. Medium Weigt = 13 oz. is probably the most universal and popular weight for kilts today. Light weight = 10-11 oz. is primarily for kilts to be used in a hot climate. Purists will say that a light weight kilt does not have the right swing and that it needs a lot of ironing. It is not what I have experienced myself. Really light weight is 8 oz. Should you want a kilt that light weight, you might take a look at Californian based Sport Kilt. In general, a heavy weight tartan is more expensive than a light weight one, but the price is also affected by the mill that delivers the tartan. Reputable tartan mills are Lochcarron, House of Edgar, Strathmore, Marton Mills, D.C. Dalgliesh (Scotweb owned), and a few more. Given an 8 yard kilt takes 4 yards double width cloth the weight should in 16 oz. be over 1.8 kg plus lining, straps and buckles. Reducing it to 5 yard 13 oz. means going down to about half the weight. And a 4 yard 8 oz. Velcro closed Sport Kilt is about 500 grams only. The tartan can be wool or nowadays also PV/acrylic. Most of my kilts are 13 oz. 5 yard kilts. Tartans are almost synonymous with the traditional kilt and more than 3.000 tartans are registered. 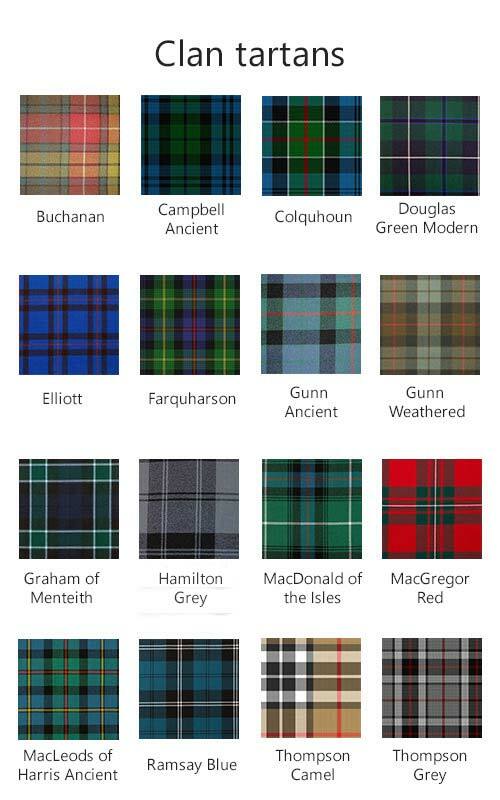 There are clan (family) tartans for members of Scottish clans; there are district tartans for men with an affinition to a certain geographical area, commemorative tartans to celebrate/remember something, and universal tartans (fashion tartans) for men without clan affiliation. And finally there are corporate tartans, designed for and registered by some companies. Every man is free to wear any universal, commemorative, or district tartan. And no law forbids you to wear a clan tartan. Provided you wear your kilt in a proper way hardly anyone should object, should you be seen wearing "his" tartan. And even when, how could anyone prove that you had no “right” to wear it? He himself would probably be wearing trousers, so where was his own proof? Some tartans are more expensive than others. 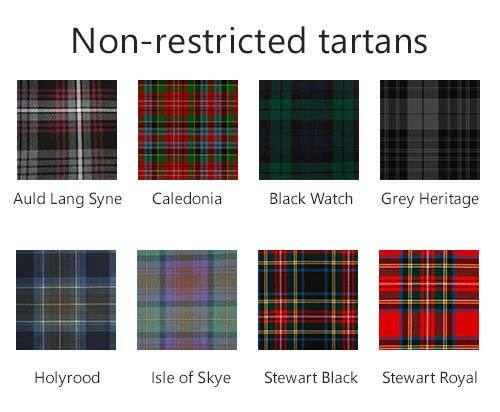 In general popular and wide spread (clan and universal) tartans are cheaper than district tartans. Clan tartans. If you like them, buy them, wear them, but show respect. On a traditional kilt the outer apron will normally have fringes. Can be two or three, but also none may be a possibility. When you order a kilt on the internet it is rather unlikely that you shall be asked what you prefer. 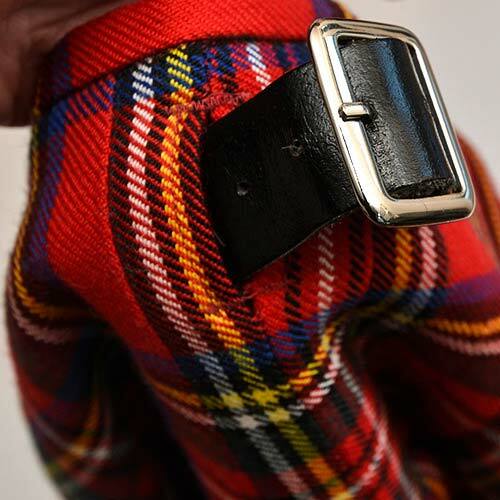 Your kilt can be hand stitched for utmost precision or it can be sewn on the machine. It can be made to your measures by a skilled kilt maker in Scotland or other parts of the UK, or in the US or Canada. Or it can be made in a factory in Pakistan or China or another low labour cost country to be sold off the peg – like practically all the clothes we otherwise buy, being they cheap or expensive brands. . I think above description gives you a picture of something costing a fortune and something perhaps pretty affordable. And you are right. You can have a kilt setting you back £800 or £25. And everything in between.